B112 Flexible Techno-Edge™ wax/resin ribbon is specifically designed to work with near edge technology printers in high volume labeling applications like flexible film and, print and apply applications. B112 wax/resin ribbons use low print energy and provide consistent print quality, and clean dot edges for bar codes that are dark, dense and readable on a wide range of paper and film media at high print speeds. This Techno-Edge™ wax/resin ribbon is UV resistant and offers outstanding performance characteristics. 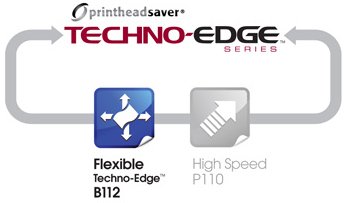 CLICK HERE to view the B112 Flexible Techno-Edge™ data sheet.